Want a sampling of snacks fit for a vegan lifestyle? Take a bite of this. With the abundance of genetically modified food, animal fats and myriad other elements in many of today's snack foods, finding a clean, vegan-friendly way to beat the munchies can be a bit of a challenge. That's exactly why a helpful little site called Vegan Cuts has emerged: to make it fun and easy for folks to discover new vegan products and shop cruelty-free. So, it offers a veritable cornucopia of goodness on its website, refreshing its deals each week to include new foods, clothing, shoes, accessories and home goods that blend perfectly into a vegan lifestyle. Want a sampler to get you started? 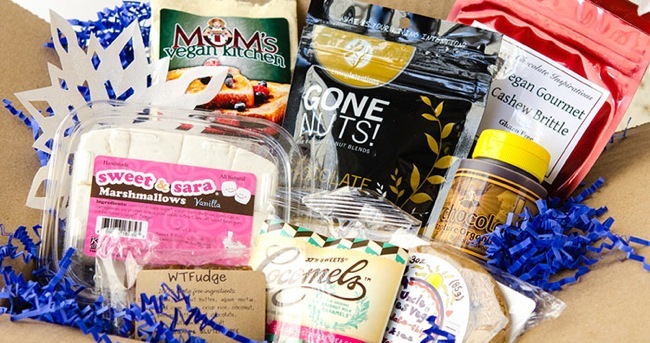 Try the holiday care package ($39), shown above; it's filled with -- deep breath -- Sweet & Sara Marshmallows, JJ's Sweets Cocomels, Obsessive Confection Disorder Fudge, Chocolate Inspirations Cashew Brittle, Mom's Vegan Kitchen French Toast Mix, Holy Kakow Chocolate Syrup, Gone Nuts! White Chocolate Cashews, and Uncle Eddie's Cookies. That's a whole lot of deliciousness for just $39, and not one hair on an animal's head was harmed during the making of any of it. A perfect gift for that vegan office mate or in-law, and a perfect complement to a holiday movie night, this basket of crunchy good fun is sure to please the palate of even the most discerning recipient. After all, variety's the spice of life, and thoughtfulness sure is sweet.